By TV_Paige, October 2, 2012 in And The Award Goes To . 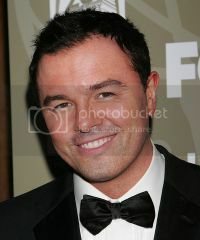 . .
LOS ANGELES, California — "Family Guy" creator Seth MacFarlane says being invited to host the 2013 Academy Awards "was the greatest call that I could have gotten in show business." Oscar telecast producers Craig Zadan and Neil Meron announced that MacFarlane will host the 85th Annual Academy Awards ceremony in February. Meron called the 38-year-old entertainer "the most unbelievable, consummate host choice we could think of." Zadan said they have long admired MacFarlane's talent, "so the idea of actually doing the biggest thing that we've ever produced with him is just beyond belief. We're so excited." This is the first Oscar production for Zadan and Meron, whose credits include 2002 best picture winner "Chicago" and the musical TV show "Smash." MacFarlane is best known for his envelope-pushing animated TV shows "Family Guy," ''American Dad!" and "The Cleveland Show." MacFarlane made his big-screen directorial debut earlier this year with the irreverent R-rated comedy "Ted," which took in more than $420 million at the box office. He also hosted the season opener of "Saturday Night Live" last month and released an album of big-band tunes from the 1940s and '50s last year. This is his first time hosting the Academy Awards, which he called "an overwhelming privilege." So will this be an edgier ceremony than in years past? Zadan and Meron prefer to describe the approach as "fresh." They'll draw on MacFarlane's skills as "a terrific writer and performer and singer and dancer," Zadan said. "We're going to utilize every one of them and see where we come out, but we hope to do something brand new and fresh based on the fact that we have a brand new and fresh host." MacFarlane said his favorite Oscar hosts are the classics of yesteryear: Johnny Carson and Bob Hope. "There's a lot of questions about edging-up the show, but I am a big fan of the kind of old-fashioned showmanship that those hosts embodied," he said. "I think that's really, in a perfect world, the balance that should be struck: Something that's fun and relevant and genuinely funny, but at the same time has a spine of good, old-fashioned showmanship, which is what the Oscars deserves." He acknowledges it's a challenging task. "This is something very different than what I've done in the past, so the trick is going to be to stay honest to what it is that I do but also adapt to this particular show, because this is obviously a very special show with very specific requirements," he said. "We want to find a nice balance." It's too soon to say if any writers or animated characters from MacFarlane's other shows will be involved with the Oscar telecast, but music will definitely play a part. "It would be criminal to have an Oscars without music," MacFarlane said. Producers said they'll present their ideas to their new host in the coming weeks and the team is "full speed ahead to create a show." 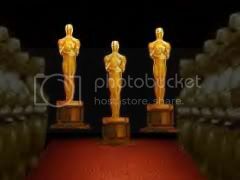 The 85th Annual Academy Awards will be presented February 24 at the Dolby Theatre at Hollywood & Highland Center in Los Angeles. Nominations will be announced Jan. 10 — nearly a week earlier than typically revealed and coming ahead of the Golden Globe Awards. MacFarlane said being invited to host the Oscar show "was just an absolute thrill and I'm very much looking forward to it." He even posted a video on YouTube of him sharing the big news with his dad. In the minute-long clip, MacFarlane says he's been asked to host the Oscars, and his dad responds by offering him some "barely used" bathing suits. "I've invited you here today to tell you I'm hosting the Oscars," MacFarlane says. "This should be huge news to you." "Of course, it's wonderful news," his father replies. "But also the fact that you're getting almost brand-new bathing suits is also good news." When MacFarlane seems unappreciative, dad snatches back the swimsuits and says, "I'm going to give these to Billy Crystal." Crystal hosted the last Oscar show. Other recent hosts include Steve Martin and Alec Baldwin, James Franco and Anne Hathaway, Hugh Jackman, Jon Stewart and Ellen DeGeneres. Film: "Beasts of the Southern Wild"